Citation: Bonfiglio CML, Bliven KCH, Raffoul AJ, et al. Multiple left accessory renal vessels. Int J Anat Var. Mar 2019;12(1):021-023. Anatomical variations of the abdominal aorta are common. Using standard techniques, abdominal and renal vessels were dissected and measured. Six accessory renal vessels were identified on the left. One accessory artery from the posterolateral abdominal aorta entered the hilum superior to the main renal artery and a corresponding accessory vein emptied into the main renal vein. Two accessory arteries from the left common iliac artery entered the kidney’s inferomedial and inferolateral pole. The corresponding accessory veins emptied into the left common iliac vein, and a lumber vein posterior to the abdominal aorta, respectively. The number of accessory renal vessels in this specimen is unusual, and the branching pattern is extremely rare. Knowledge of these variations is important for surgical procedures such as transplantation, vascular reconstruction, and abdominal aortic aneurism reconstruction. Additionally, the presence of accessory renal vessels has been associated with renal pathology such as hypertension and hydronephrosis. Morphological variations of blood vessels within the abdominal cavity have been identified both in the unpaired anterior branches and paired lateral branches of the abdominal aorta [1-6]. A variety of variations have been documented including the presence of accessory visceral arteries , atypical branching patterns , varied sites of origin , or a combination of variations [5,8]. Accessory renal arteries typically arise from the abdominal aorta, superior to the main renal artery and have a reported frequency of 9%-76%, with an average of 28% . The incidence decreases with each additional accessory artery, such that three accessory renal arteries have only been identified in 0.2-2.0% of specimens . Accessory renal veins exit the kidney and typically enter the inferior vena cava separate from the main renal vein. They are much less common than accessory renal arteries with a frequency of 0.4-6% . Knowledge of these variations is of particular importance for clinical and surgical procedures within the abdominal cavity. During a routine anatomy dissection session, clinical anatomy faculty identified several variations in the renal vasculature supplying the left kidney in an 81 year old male cadaveric donor. The abdominal viscera were reflected to allow dissection of the posterior abdominal wall. The abdominal aorta, superior mesenteric artery, inferior mesenteric artery, common iliac arteries, and renal arteries were visualized, and diameters and distances were measured to describe vascular variations. The average of three measurements taken by a single rater using a digital caliper (Mitutoyo America Corp., Aurora, IL) was recorded. The corresponding veins were dissected along their course to the inferior vena cava (Figure 1). 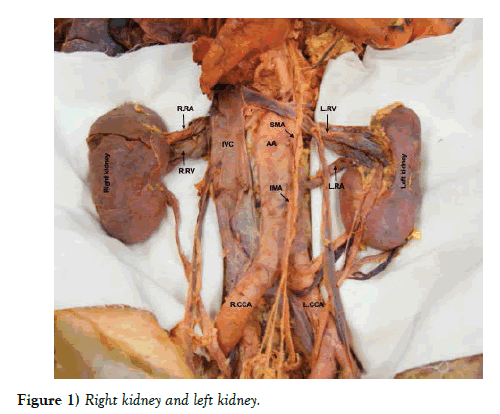 Figure 1: Right kidney and left kidney. The right renal vascular supply was typical, but three accessory renal arteries and three accessory renal veins in addition to the main renal artery and vein were identified on the left side. A left accessory superior renal artery branched off the posterolateral aspect of the abdominal aorta, 14.9 mm inferior to the superior mesenteric artery (Figure 2a). It was 5.2 mm in diameter and coursed laterally to enter the hilum of the left kidney. The corresponding left accessory renal vein drained directly into the left main renal vein. Figure 2: (2a) Left accessory superior renal artery (2b) Left main renal artery (2c) Left accessory inferomedial polar renal artery (2d) Left accessory inferolateral polar renal artery. The left main renal artery branched laterally from the abdominal aorta 65.7 mm inferior to the superior mesenteric artery. It was 7.2 mm in diameter and coursed laterally toward the left kidney (Figure 2b). Before entering the hilum, the left main renal artery branched into two smaller, hilar, arteries. Instead of passing posterior to the left main renal vein, the left main renal artery and vein were parallel, with the artery positioned inferior to its corresponding vein. Three main tributaries exited the hilum to form the left main renal vein, which received the testicular, suprarenal, and accessory superior renal veins as it coursed medially, anterior to the abdominal aorta, to enter the inferior vena cava. 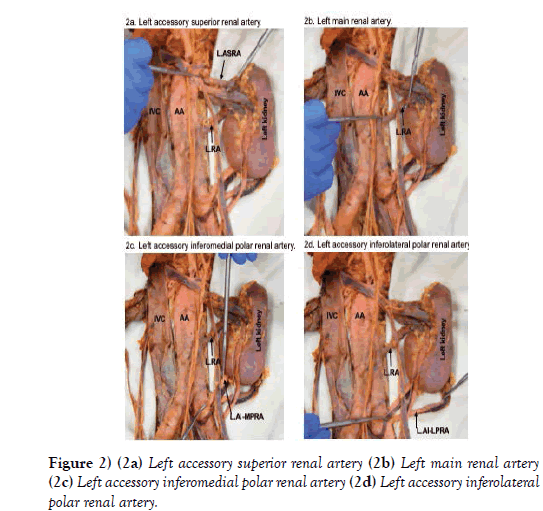 There were two apparent left accessory inferior renal polar arteries and veins. The left accessory inferomedial renal polar artery branched from the anterior aspect of the left common iliac artery, 10.2 mm distal to the bifurcation of the abdominal aorta (Figures 2c and 2d). It was 4.3 mm in diameter and coursed superolaterally to enter the posterior surface of the inferomedial pole of the left kidney. The corresponding vein exited the posterior surface of the inferomedial pole, posterior to its artery, and coursed inferomedially, crossed anterior to the left common iliac artery, and entered the left common iliac vein (Figure 3a). 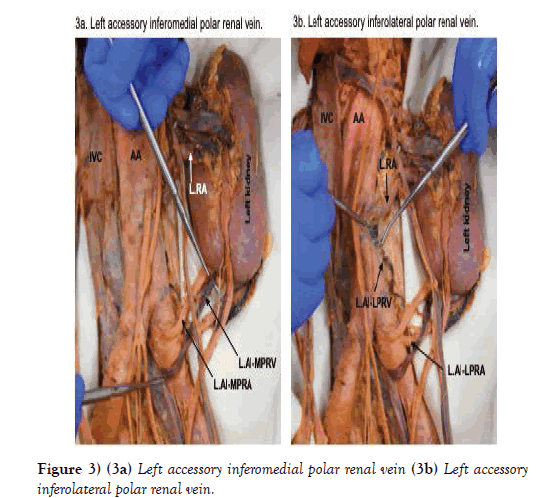 Figure 3: (3a) Left accessory inferomedial polar renal vein (3b) Left accessory inferolateral polar renal vein. The left accessory inferolateral renal polar artery branched from the lateral aspect of the left common iliac artery, 23.3 mm distal to the bifurcation of the abdominal aorta (Figure 2d). It was 3.6 mm in diameter and coursed superolaterally toward the left kidney. As it did, the artery passed posterior to the ureter and testicular vessels before entering the posterior surface of the inferolateral pole of the left kidney. The corresponding vein exited the posterior surface of the inferolateral pole, coursed inferomedially where it bifurcated. Both branches passed posterior to the left accessory inferomedial renal polar artery, then immediately converged into one vein that changed direction and coursed superiorly and posteriorly toward the abdominal aorta where it emptied into a lumbar vein (Figure 3b). Overall, the right renal blood supply was typical. The right renal artery branched off the anterolateral abdominal aorta 4.4 mm inferior to the superior mesenteric artery. It was 7.2 mm in diameter and coursed laterally and posterior to the inferior vena cava, bifurcated into anterior and posterior branches, which went around the right renal vein, where each branch bifurcated before entering the hilum of the right kidney. The superior anterior and posterior branches were slightly smaller in diameter than the inferior anterior and posterior branches. The right renal vein exited the hilum of the right kidney and coursed medially and parallel to its corresponding artery until it entered the inferior vena cava. No other congenital variations were found. Embryologically, the kidneys develop in the fetal pelvis and ascend to their final position on the posterior abdominal wall. During the ascent, blood vessels that supply the kidneys develop on the adjacent vascular structures such as the common iliac vessels and abdominal aorta. As the organs continue to ascend, new vessels develop while the preceding vessels regress until the ninth week of development when the kidneys reach the suprarenal glands . Occasionally, the preceding vessels persist resulting in a varied vascular supply to the kidneys . The presence of accessory renal vessels is not unusual and can appear in approximately 25% of the population . While renal vascular variations have been described previously, the present case study describes a unique and less common variation that may warrant further study. The presence of three accessory renal arteries is rare. It has been documented in only 0.2%-2.0% of specimens . The persistent branches from the common iliac artery are uncommon, and as they enter the inferior pole of the kidney, it is important to note that these are end arteries. Damage to an end artery could result in an ischemic region of the kidney which it supplies . This is a particularly important consideration of feasibility for a surgical team planning a transplant. Additionally, inferior polar arteries often supply the ureter. Damage of inferior polar arteries may lead to ureteric necrosis, paralysis, or urinary leaks . Awareness of accessory renal arteries is important as additional vessels entering or exiting the hilum can cause compression of the renal pelvis and inferior polar arteries can obstruct the ureter, both potentially resulting in hydronephrosis . Stenosis of renal arteries from conditions such as celiac artery compression syndrome or entrapment from the diaphragmatic crus has been documented . Such entrapment may account for up to 30% of refractory hypertension. Accessory renal arteries, such as the superior renal artery in this case, could be implicated in this type of condition. Additionally, the presence of accessory renal arteries has been identified as a cause of renin-dependent hypertension and are highly prevalent in resistant hypertension [16,17]. While accessory renal arteries are thought to be found in approximately a quarter of the population, accessory renal veins are much more infrequent [10,13]. As described by Satyapal et al., accessory renal veins can present as: 1) renal collar, where two renal veins pass anterior and posterior to the abdominal aorta; 2) retro-aortic, where they pass posterior to the abdominal aorta; 3) additional renal veins which emerge from the kidney and enter the inferior vena cava separate from the main renal vein; or 4) primary tributaries, in which accessory renal veins drain into the main renal vein. In the present case study, the superior accessory renal vein was a primary tributary, the inferolateral accessory renal polar vein was retro-aortic, but the inferomedial accessory renal polar vein did not follow any of the previously described patterns. Clinically, left renal entrapment syndrome, also known as nutcracker syndrome, typically occurs where the left renal vein passes between the abdominal aorta and the superior mesenteric artery . Anatomic variations of the left renal vein, particularly with an atypical branching pattern as is demonstrated in this case report, are important to understand when considering diagnosis of such entrapment pathologies. To the best of our knowledge, this particular variation of the left renal vessels has not been previously documented. Dissemination of anatomic variations of the renal arteries is important for anatomists, clinicians, and surgeons. Vascular complications of vessels with normal vascular anatomy have been documented in 1.7% of retroperitoneal procedures . Surgical procedures in the retroperitoneal space such as abdominal aortic aneurism repair, ureteric procedures, and renal transplant may result in damage of accessory renal vessels and an increase in vascular complications if they are not properly identified. Furthermore, the increased reliance on laparoscopic surgical procedures, which may limit the visibility of accessory vessels, emphasizes the importance of understanding potential variations of renal vessels to prevent iatrogenic vascular injury. The authors would like to thank the donor for his selfless contribution to the education of others. The authors would also like to acknowledge Dr. Barton Anderson, A.T. Still University, for his photography assistance with this case report. Merklin RJ, Michels NA. The variant renal and suprarenal blood supply with data on the inferior phrenic, ureteral and gonadal arteries: a statistical analysis based on 185 dissections and review of the literature. J Int Coll Surg. 1958;29:41-76. Olewnik L, Wysiadecki G, Polguj M, et al. A rare anastomosis between the common hepatic artery and the superior mesenteric artery: a case report. Surg Radiol Anat. 2017;39:1175-9. Olewnik L, Wysiadecki G, Polguj M, et al. Types of coeliac trunk branching including accessory hepatic arteries: a new point of view based on cadaveric study. Folia Morphologica. 2017;6:660-7. Covanțev S, Mazuruc N, Belic O. An unusual case of colon vascularization by the inferior mesenteric artery. J Vasc Bras. 2017;16:52-5. Polguj M, Podgorski M, Hogendorf P, et al. Variations of the hepatobiliary vasculature including coexistence of accessory right hepatic artery with unusually arising double cystic arteries: case report and literature review. Anat Sci Int. 2014;89:195-8. Iacob N, Sas I, Joseph SC, et al. Anomalous pattern of origin of the left gastric, splenic, and common hepatic arteries arising independently from the abdominal aorta. Romanian J Morphol Embryol. 2014;55:1449-53. Jamkar AA, Khan B, Joshi DS. Anatomical study of renal and accessory renal arteries. Saudi J Kidney Dis Transpl. 2017;28:292-7. Olewnik L, Wasniewska A, Polguj M, et al. Rare combined variations of renal, suprarenal, phrenic and accessory hepatic arteries. Surg Radiol Anat. 2018;40:743-8. Sido FG, Zimmermann A, Seceleanu A, et al. Variante Anatomice Ale Arterelor Renale. Clujul Medical. 2010;83:263-71. Satyapal KS, Kalideen JM, Haffejee AA, et al. Left renal vein variations. Surg Radiol Anat. 1999;21:77-81. Keibel F, Mall F. Manual of human embryology II. JB Lippincott Company, Philadelphia, USA. 1912. Moore KL, Persaud TVN, Torchia MG. The developing human: clinically oriented embryology. Elsevier Health Sciences; 2015. Nayak SB, Sirasanagandla SR, Shetty SD, et al. Multiple vascular variations at the vicinity of the left kidney. Anat Sci Int. 2013;88:230-3. Tardo DT, Briggs C, Ahern G, et al. Anatomical variations of the renal arterial vasculature: An Australian perspective. J Med Imaging Radiat Oncol. 2017;61:643-9. Arazinska A, Polguj M, Wojciechowski A, et al. An unusual case of left renal artery compression: a rare type of median arcuate ligament syndrome. Surg Radiol Anat. 2016;38:379-82. Kem DC, Lyons DF, Wenzl J, et al. Renin-dependent hypertension caused by nonfocal stenotic aberrant renal arteries: proof of a new syndrome. Hypertension. 2005;46:380-5. VonAchen P, Hamann J, Houghland T, et al. Accessory renal arteries: Prevalence in resistant hypertension and an important role in nonresponse to radiofrequency renal denervation. Cardiovasc Revasc Med. 2016;17:470-3. Polguj M, Topol M, Majos A. An unusual case of left venous renal entrapment syndrome: a new type of nutcracker phenomenon? Surg Radiol Anat. 2013;35:263-7. Meraney AM, Samee AAE, Gill IS. Vascular and bowel complications during retroperitoneal laparoscopic surgery. J Urol. 2002;168:1941-4.